Metrics 103: Pace Construction | Mediterra - Swim & Run Better Than Ever! Can we assume that two swimmers who achieve the same Pace are equal in efficiency as well (in both terms of physics and of physiology)? No. Because the same Pace can be constructed by different combinations of SPL x Tempo, and each of those different combinations represent a different energy expense for different bodies. All four of these combinations produce the same Pace. But which one is best to use? If we have two swimmers of similar capabilities in terms of Pace, but one is 1.60 meters tall and one is 1.85 meters tall, which combination might be more appropriate to the shorter swimmer? And which will likely more more appropriate to the tall one? Yes, it makes sense that a taller swimmer, relatively speaking, should take advantage of his greater wingspan to take longer strokes (longer strokes = smaller SPL) with a lower Tempo. And vice versa, a shorter swimmer should aim to use relatively shorter strokes and higher Tempo. The taller swimmer has more mechanical leverage over the shorter swimmer, and there is more distance across his wingspan, it takes more time and more energy to move the mass of those long arms across that distance, compared to hers. So, to figure out which Pace combination a swimmer might use wingspan is the first piece of data we look at. By wingspan we estimate (based on a statistical analysis of swimmers, and reinforced by experience) the appropriate range of stroke length an efficient swimmer should be capable of. That is what the previous Metrics 101: Stroke Length posts were about. This the reason this particular metric comes first when we talk about speed. The next variable I discussed – in relationship to Stroke Length – was Tempo in my Metrics 102 posts, because swimming faster is governed by the equation Pace = SPL x Tempo. Tempo only has meaning when combined with a Stroke Length. Those two combined create Pace. What ever your personal pace goal is, a similar charts with four options for SPL x Tempo combination could be set up for you too. Which one would you choose to train for and use? We have a hypothetical swim student, Peter, who knows he needs to improve his Stroke Length, but he’s feeling a bit impatient about getting to ‘work on speed’. Peter realizes his optimal SPL Sweet Spot should be at most 18 SPL (16-18 SPL actually). But currently he can maintain only 22 SPL. He is capable of swimming 22 SPL x 1.25 Tempo for a Pace of 30 seconds per 25 m, and he can hold that average Pace for 1000 meters for a time of 20:00 minutes. But that is as fast as he can go. He can swim with a faster Tempo but he actually starts swimming slower when he does. However, Peter has a goal of swimming 15:00 for that 1000 meters. 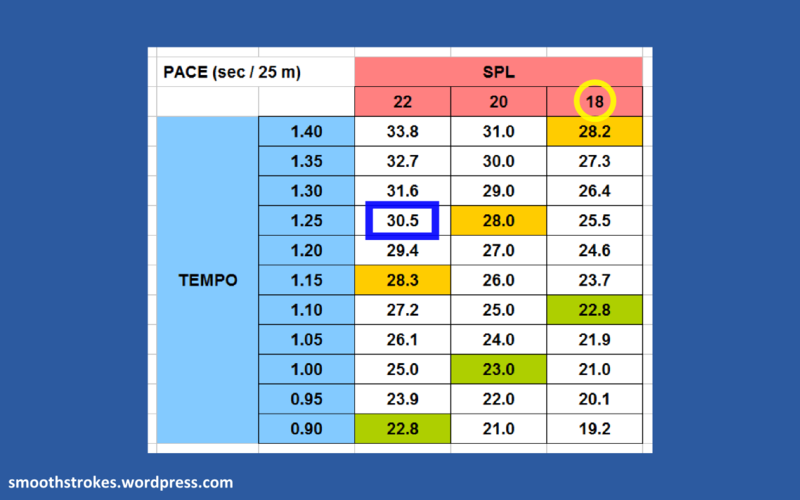 That would require he maintain a Pace of 22.5 seconds for 25 m.
Let’s look at a Pace Table chart to show us how Peter could construct his pace at three values: his current SPL ability of 22, 20, and at the edge of his Sweet Spot 18 SPL. Look carefully. Peter is currently swimming with 22 SPL. That’s the first column. 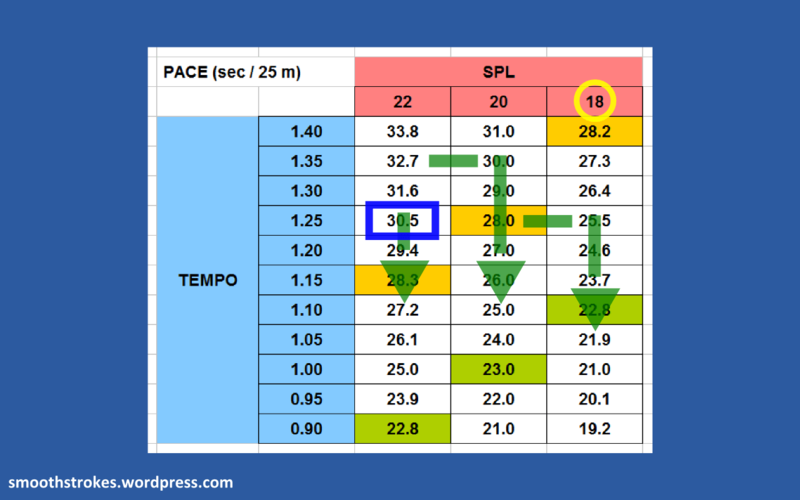 And at his best Tempo of 1.25, he is just able to hold 30 second pace (in the blue box). That is his current Pace ability. Peter understands that he should have an SPL of no more than 18 (in the yellow circle), but doesn’t have that skill yet. Peter wants to achieve 22.5 second Pace (one of the green boxes), which is the Pace he needs to achieve to reach his 1000 meter goal. But we should encourage Peter to work on achieving a smaller goal first, something like a Pace of 28 seconds (one of the gold boxes). Which SPL x Tempo combination should he aim for? 1) He can aim for the gold box below by holding 22 SPL and work on gradually increasing his Tempo -0.10 seconds. 2) He can aim for the gold box in the adjacent column by holding 1.25 Tempo and gradually improving his SPL to 20. 3) He can aim for either the gold box next door or the one under the last column by lowering his Tempo back to 1.40 (or turning it off completely), gradually improving Stroke Length and then building Tempo back onto that new Stroke Length ability. Peter needs to carefully consider which route to take. Some routes will cause the swimmer to run out of energy and control before he can reach his true potential, while others will open it up for him. First, let’s ask this question: what is a good Stroke Length? Universally speaking, the closer your SPL is to your optimal SPL, the better your stroke is (meaning, you are more likely to be in position to achieve your best energy efficiency for speed). Relatively speaking, the closer your stroke is to the best stroke you are capable of producing right now the better your stroke is. Flip that and you’ve got the definition of a poor stroke. On the overall scale, you need to know where you should be aiming. But today, you need to know where you are at right now and work on improving one step from there. So, the first and most misguided approach is to building your target Pace is to increase Tempo on a poor stroke, outside your optimal zone, and/or less than your best today. The problem with this is that Peter’s short stroke length, and his inability to lengthen it, points to some bigger problems in technique that are only going to be magnified by higher Tempo and higher intensity. These will increase exhaustion rather than increase speed. Those problems don’t go away by swimming ‘harder’. They only go away by training smarter. The stress of increased Tempo diverts precious resources the brain needs in order to hold onto good form and improve it – increasing Tempo make it harder to even notice distinct errors, let alone make corrections. 1) He is going to reach a threshold Tempo beyond which he simply cannot maintain any decent stroke. 0.90 is an extremely fast Tempo to most of those who don’t have a competitive swimming background in their youth (who can handle Tempos down into the 0.60’s!). And if he doesn’t have control over his Stroke Length now, at easy Tempos, it will not magically appear at high Tempos. 2) Stroke Length is hard to develop and harder to preserve compared to Tempo yet far more effective in terms of creating and sustaining Pace. I don’t mean to be harsh about it, but I think most swimmers and many coaches run to Tempo in the attempt to affect speed because they simply don’t know how to create a longer stroke without strain. That was the case in my competitive youth and experience up until I encountered TI. The fact is, it really takes understanding and hard concentration work to build optimal Stroke Length. A high Tempo can be achieved (without regard for SL) with virtually no thought, while improving Stroke Length requires intense concentration on particular skills of motor-control. There is a reason the best of the best usually win with a longer stroke, lower Tempo than their competitors. Notice that in virtually all races, novice to elite, Stroke Length is shortening drastically as exhaustion takes over and Tempo is increasing dramatically to compensate, but rarely enough – everyone slows down at the end. High Tempo is easy and low value. Optimal Stroke Length is hard and high value. We urge swimmers to not cop out of the hard work up front – it will pay off in the end, literally. If Peter already has an exhausting stroke cranking up the Tempo is a sure way to make it worse. So Peter needs to make corrections and take time to imprint them in a lower stress situation before he tests that stroke under stress. Then, in a test of higher Tempo, he needs to make careful observation and measurement of what corrections stuck and which need more time or attention to imprint under low stress conditions. Peter might try to increase his Tempo to some point, then hold that high Tempo and attempt to lengthen his stroke (lower his SPL). This is extremely tough, if not impossible to do. SPL control is primarily a motor-control skill. The brain does not learn new motor control this way very well. Again, under stress like this, the brain is having precious resources diverted that it needs to pay attention and make corrections. Even elites are not capable of lengthening their stroke under highest Tempo or intensity – they are, at best slowing that degradation down better than their competitors are, but their Stroke Length still degrades. Stroke Length is a skill, and to improve it, Peter needs to set up the right conditions for achieving new levels of motor-control. Then he can stress it and test it. This is the basic idea – Peter would slow things down (to a comfortably low Tempo), build control over the optimal Stroke Length at low intensity, low Tempo until he reaches his optimal SPL of 18, and then gradually increase the challenge on that optimal Stroke Length to make it more and more durable under higher Tempo and longer distances. But it is understandable that Peter, and swimmers like him, may find that process of working the Stroke Length over and over from 22 to 18 SPL a bit tedious. It takes different people different amounts of time to get to their optimal zone, and keeping those practices engaging and fun are part of the art of training as well. That art also takes time to develop. 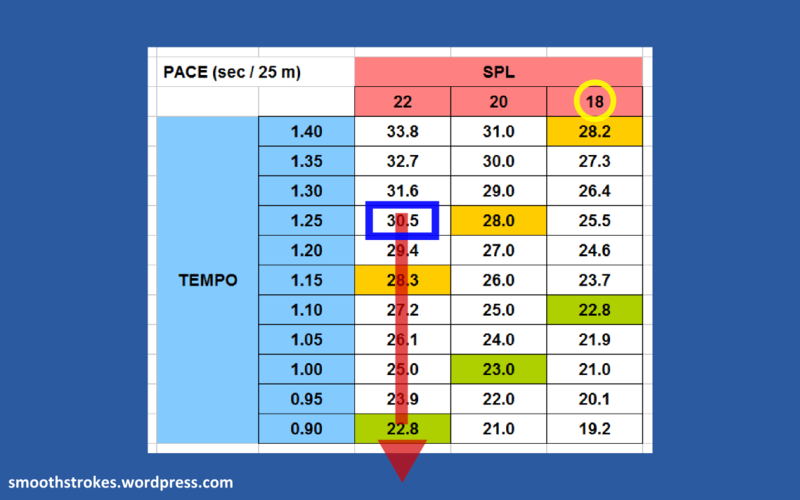 Peter can work on Tempo with his current 22 SPL for a while, and he will learn a great deal about how Pace works, how to train, and how much energy Tempo takes up with a less-than-ideal Stroke Length. After he has made a bit of progress at that particular SPL, instead of increasing challenge by increasing Tempo, he will lower Tempo a bit and then increase the challenge by lowering his target SPL to 20. He will need to spend some time just learning how to better shape his body and synchronize movements to achieve that 20 SPL. Peter may even need to turn Tempo down further, (or just don’t constrain yourself by it) for a while until he learns how to get better control over his Stroke Length. Then he can start the Pace building process again for a while. And then he can back off Tempo, lower his target SPL to 18, and go again, and so on. So, if you construct your own Pace chart, what SPL x Tempo combination would you choose, and which route to building it would you take? thx for sharing this with us, but too advanced notions for my swimming level. Still struggling to lower my SPL under 21 per 25 meters for my 173 height 64 kg and 178 cm armspan, and always out of breath after 100 meters in a raw, heart pounding at 150, too much for my 54 years. A balance issue, cause I don’t feel swimming down hill. And a breathing issue : even when I run I need to breath a lot, which I do not have time to do, while I swim freestyle, particularly on my right side . Fixed that link. Thank you for pointing it out! It showed up in the editor, but not on the published article. So what you are saying in your last paragraph is that the swimmer should lower his tempo (or turn it off) and develop an easy stroke, then try to increase distance at that slower rate, and once that is done, increase the tempo, and go thru that same process again? Yes, I am describing a simplified way of going about Pace improvement. One could make it a lot more complicated, but for those who are new to the measurements and the internal conditions for holding SPL and holding Tempo on top of that, I highly recommend carefully working on a small SPL improvement goal first (just hold it for one length! ), then adding distance (now do it for 4 lengths, then 20 lengths, then 50…), then start adding Tempo constraints (with distance intervals). Reading about this will only make partial sense, but once you start feeling the concepts in your own body as you train for these specific kinds of motor control it will make a lot more sense. Then you can go back through the process with more body-understanding, not just intellectual, and customize the process more to your self. Think about it like a computer. A computer has background processes (which generally use little o the working memory) and then it has the applications (programs) you have opened and are using on the front end (which use up a lot of memory). You know the computer can handle only so many programs opened at once or else the memory clogs up and everything freezes. This is a helpful analogy for the brain – your brain, while training can only concentrate on so many new skills at once. The goal is to turn on a select few, work them until they can become so automatic that they become like ‘background processes’ that you don’t have to think about and don’t take so much energy – they just respond to the conditions as you have trained them to (like your breathing or eye blinking happens appropriately without thinking). SPL is a foundation skill so it needs to be done first and it is difficult to imprint – it will take up a great deal of the ‘computer memory’ to develop at first, but once your neuro-muscular system has memorized the patterns, you can add new challenges to the front end without freezing up the computer – what I suggested here is that you add more distance (going farther with consistent SPL) as the first level of increased challenge, and then add Tempo as the second level of increased challenge. But one could re-arrange the order of the challenges to discover different things about these skills and how they work together. The key to this is to add just enough challenge at any one time, not too much and not too little. Increasing both distance and tempo (beyond what is already programmed into your neuro-muscular and metabolic system) at the same time is a great way to crash the computer and not make much progress.